Yardy River Tours - Barrett Adventures the Real Jamaican Adventures. From the first rapids to the last little waterfall, it is an amazing trip down stream. Jim is just sliding into the first rapids. There are lots of them. Our two guides, Keno and Erlando ...... took excellent care of Terresa and Jim. Here is Terresa getting pointed in the right direction by Keno. As Jim said, "I didn't have to lift a finger. The guys pulled me out of every eddy I got into." I'm not at all sure I like this picture, but I didn't get a picture of Jim jumping off this tree. The river is magnificent! Lots of places to stop and swim in deep spots along the way. Terresa is luxuriating at the end of the tubing on top of the waterfall. We are all feeling totally relaxed and happy after a wonderful day. The Yardy River Tour is fun for the whole family. 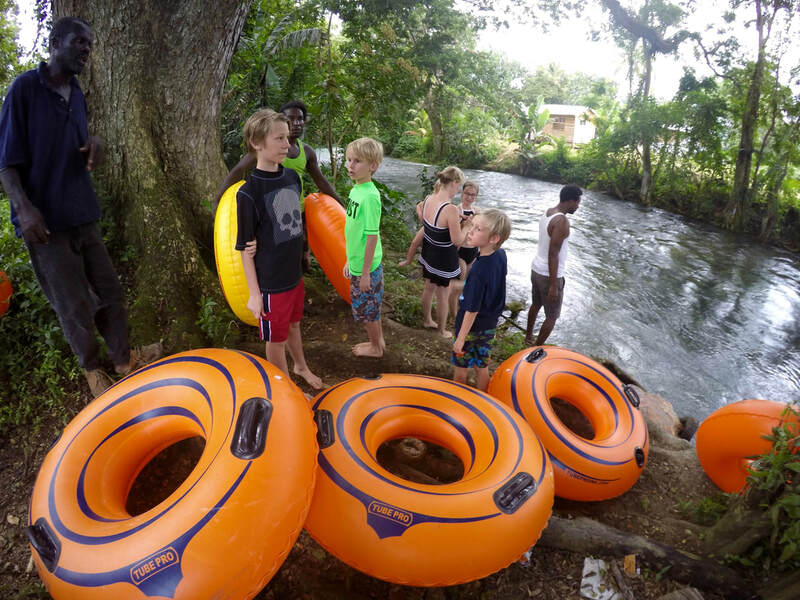 Heidi and her five children from 2 to 15, came on a cruise and had a great time doing both Yardy Tubing and Mayfield Falls for their day in port. If you wish to combine it with other activities in the area, such as Mayfield Falls, or Animal Farm, write me for more information.